Point Cloud, as seen in the famous musical masterpiece, is a data type growing in popularity lately. It often comes from LIDAR sensors, which generate 300k to 500k points/s these days. They can also come out of a Structure-from-Motion computation, based on simple pictures. Data volumes, as well as some specific aspects of this data type ( e.g. no fixed schema ) lead to new challenges in the softwares needed to handle Point Clouds. A similarly growing number of persons work on these challenges, especially in the OSGeo community. 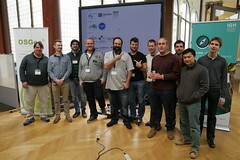 This post summarizes some of the achievement in this field for the OSGeo Codesprint in Paris. Hobu’s team was present at the codesprint, with Howard Butler, Connor Manning and Andrew Bell. They disclosed two technologies they have been working on in the last months : Greyhound and Entwine. Entwine is a Point Cloud data preparation library, indexing large amounts of data in distributed file systems. Connor Manning improved the performances of this new software. Greyhound is a Point Cloud streaming server. It is based on Entwine for data access, and is able to answer queries, streaming corresponding points giving a location, LOD and other informations. Greyhound and Entwine focus on serving large amounts of data with high performances. Greyhound was originally bundled with Plas.io, which is a WebGL client to visualize point cloud data served by Greyhound. During the codesprint, Hobu’s collaborators teamed with Maarten van Meersbergen and Oscar Martinez Rubi and achived to plug Potree to Greyhound. This is a really interesting improvement, since potree is currently the most advanced opensource point cloud visualization tool. Furthermore, it is a step towards interoperability. The Open Geospatial Consortium being currently interested in Point Cloud formats and protocol standardization, the work achieved during the codesprint makes a good pragmatic implementation as a base for standardization discussions. 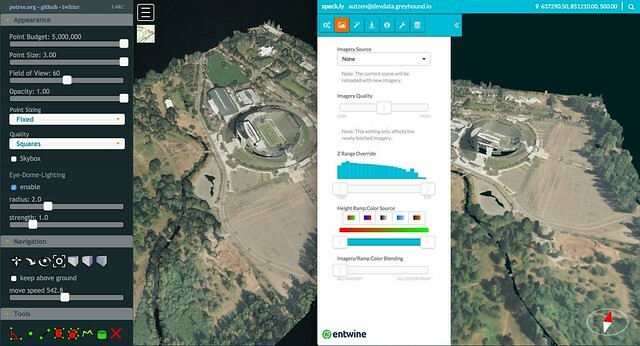 The iTowns project is a 3D WebGL geospatial visualization solution, developped by the French national mapping agency ( IGN ), Oslandia and AtolCD. We are currently working on the future version of iTowns, improving the code base and adding new features. During the Codesprint, Quoc worked on integrating Potree inside iTowns for massive Point Cloud data visualization. Both projects are based on THREE.js, therefore the incorporation makes sense. He managed to get a working prototype, displaying Point Clouds from a Potree data source ( Flat files structure ) inside iTowns. This work is currently in a specific branch, as it required some modifications on the potree side. Next steps will be to propose modularization refactoring to potree so that the integration into other frameworks can be done easily. Our PhD student, Jeremy Gaillard spent some time improving its building server. It is a piece of software serving 3D objects, namely buildings, from a PostGIS database to a web client. Jeremy enhanced the indexing mechanism, which allows to load the data on the client following priorities given by a cost function. It allows for example to visualize specific landmarks first, or big buildings, or another characteristics used as priority . You will find more details in Howard Butler’s post.